In previous videos I've shown you how to use the Janome Circular Sewing Attachment to create stitched circles on your projects, but you can use it for other applications too. 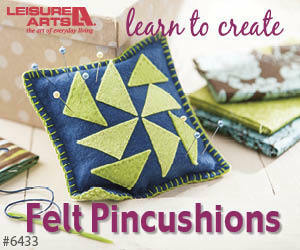 This Telecast Thursday I'll show you how to use this attachment to create perfect appliqué circles. It's easy and accurate. You'll need some fusible interfacing and fabric, large enough to create the desired size of you circle. Learn how to make your own appliqué circles by watching the video below or on my Youtube channel. What can you create with the Janome Circular Sewing Attachment? Share your ideas in the comments below. I've found the perfect tool to create circles on my Janome Horizon Memory Craft 8900 QCP sewing machine: the circular sewing attachment. The one I purchased, #202106009 fits on my machine and will also work on the Janome Horizon Memory Craft 8200 QCP machine. Check with your local Janome dealer or on-line to see if this attachment fits your sewing machine or if there is another option for you. This attachment can be used to create a variety of effects, but first you have to know how it works and how to attach it to your sewing machine. Watch the video below or on my Youtube channel for an overview of this multi-use attachment. I'll have more blogposts and videos on this attachment so you can see all the different ways it can add intricacy to your quilt projects.